The snow peas have begun their happy ascent up the “teepee” (back right). Two different kinds of beets have sprouted and are flourishing thus far, largely because slugs do not appear to like them — they are in good company (bottom left). The carrots have sprouted (spot them front middle-ish). The poor, sad garlic has been denuded of it’s leaves and rust has taken over the remaining stalks. 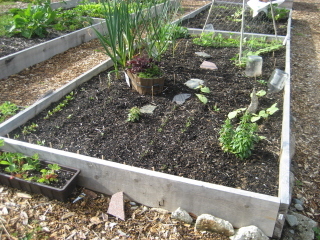 Scapes are in evidence (see if you can find them, mid-plot left side; use top photo showing healthy garlic as guide). 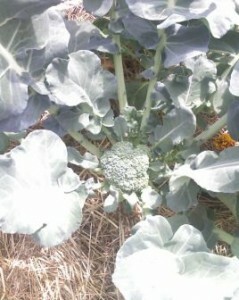 The kohlrabi, two rows next to the beets, has not made an appearance. Not a single little sprout. Okay, no great loss. The dwarf tomato (front centre of plot where the kohlrabi was planted) appears none the worse for wear despite having been transplanted twice, however, it’s not thriving either. It may be hesitating to set down roots for fear of being roused once more, poor thing. I made an unfortunate choice — or two — of locations, both of which ended up being too shady. Note to self! Only a couple of the bush beans I seeded popped out and all of them are looking pretty sickly. Near as I can figure, it’s a mix of slugs and aphids, but I’ve caught only a few of each in the act. The two red cabbages I swapped with my neighbours D&D for 3 cauliflower are taking nicely to being transplanted. The spinach is just beginning to show itself (next to the rusty garlic). One kind of kale I seeded is happily growing away, while another kind is less enthusiastic about it’s emergence into daylight (here and there). We’ll have to keep an eye on that. The sprouted brassicas I bought and added are taking hold nicely: 3 Brussels sprouts, 3 broccoli and 2 cauliflower (mixed throughout). Now if we could just get some sunshine instead of continuous clouds, cold and rain, we might see some real action! This entry was posted in 16 Oaks Community Garden, Urban Gardening and tagged 16 Oaks Community Garden, Bumbling Gardener on July 2, 2010 by local delicious. World Wide Opportunities on Organic Farms (WWOOF) is an international network of organizations that offers access to organic farms throughout the world where volunteers can learn about farming and contribute to the running of the farm in exchange for room and board. 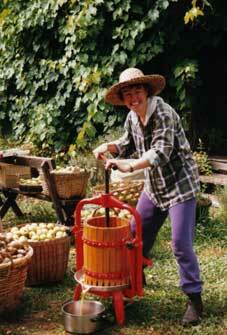 Have a genuine interest in learning about organic growing, country living or ecologically sound lifestyles. Help their hosts with daily tasks for an agreed number of hours. 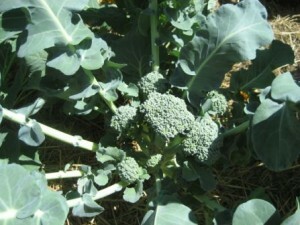 Grow organically, are in conversion, or use ecologically sound methods on their land. Provide hands-on experience of organic growing and other learning opportunities where possible. Provide clean dry accommodation and adequate food for their volunteers. Other than that, the specifics vary from host to host, with summaries posted online. For a $20 annual fee you can read the full details and contact the host whose project interests you, literally across the globe. In checking out the site I was astonished at the wide variety of locations and job descriptions, and quickly became lost in time as I contemplated how wonderful it would be to escape to a far away place and get back in touch with the land in a very tangible way. Working with livestock, building, clearing land, planting, harvesting, you name it. This entry was posted in General, Organizations and tagged Bumbling Gardener on March 1, 2010 by local delicious. We have radishes! 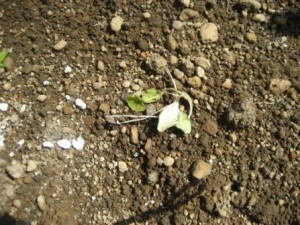 They are little, they are peaking out of the soil, and the stick says Radishes. So that’s what they are. This entry was posted in Bumbling Gardener, Urban Gardening and tagged Bumbling Gardener, radishes, Urban Gardening on May 21, 2009 by local delicious. So, the thing of it is, I’m not really a nurturer by nature. Let me just start there. It started out so well. I watered, I babied, I fussed, I coddled. I tried sprouting leeks, but the tips all dried out and they toppled over. 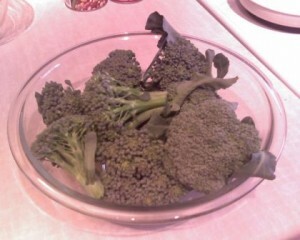 I tried cauliflower and lettuce, same thing. I tried a variety of beans, but most of the seeds rotted right in the peat pucks. In my defense I don’t have a greenhouse for these needy little sprouts, I just have a seed starter tray and a reasonably warm apartment where I regulate the heat by opening/closing the windows. It wasn’t enough. Some of those little seedlings I sprouted actually made it from my care into the ground, I’m proud to say. I had lots of squash: zucchini, acorn and spaghetti. And there were a couple of each all long and green and happy when I planted them. But sadly, it was too early to transplant. We had a few cold days. They died. 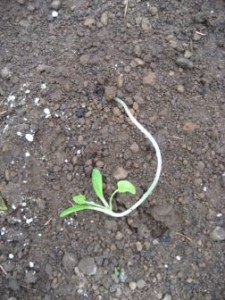 Lesson: Direct seed into the ground and the seeds will come up when they are darn good and ready. Works for me! 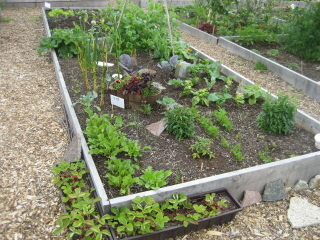 This entry was posted in Bumbling Gardener, Urban Gardening and tagged Bumbling Gardener, seedlings, squash on May 19, 2009 by local delicious.